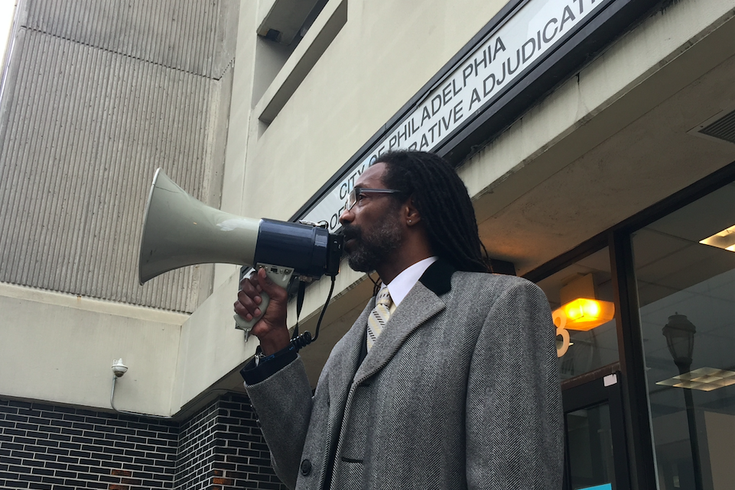 Local attorney Michael Coard went to the Philadelphia Parking Authority's Bureau of Administrative Adjudication on Thursday, December 1, 2016 to rally support for an effort to take the agency down over erroneous tickets issued to him and others. Some 14 months ago, Philadelphia attorney Michael Coard declared war on a Philadelphia Parking Authority that, in his estimation, was a "vulture" victimizing residents and visitors to the tune of $12 million in faulty tickets. His call to abolish the PPA directly stemmed from a ticket he received in September 2015 for allegedly parking in a bus zone. He believes the area on the 3900 block of Conshohocken Avenue wasn't properly marked. He showed up outside the PPA's Bureau of Administrative Adjudication with a megaphone to recruit supporters for his mission in December 2016. When the PPA appealed a Common Pleas Court decision to Commonwealth Court, both sides presented their cases to a trio of justices during a hearing in October 2017. "We don't hear a lot of parking ticket cases," said Commonwealth Court Judge Robert E. Simpson Jr. as he and Judges Renee Cohn Jubelirer and James Gardner Colins heard arguments. Nearly four months later – on Valentine's Day, no less – the Commonwealth Court judges issued an opinion that, despite one dissent, ruled on behalf of the PPA. It held that "the trial court erred" and reversed the initial decision that agreed with Coard's argument that he wasn't parked in a designated bus stop since, despite signage to that effect nearby, paint on the street didn't mark the area as such. We agree with the City that it was inappropriate for the trial court to take judicial notice that designated areas, where certain uses are permitted or prohibited, are "marked by painted lines on the roadway." That areas are designated only by painted pavement markings is contested here. Indeed, while some uses may be marked or designated by paint on the pavement, and the trial court may take judicial notice of that fact, there is no basis for extrapolating that all uses must be so marked. Moreover, the meaning of terms in the Code, including "designated," are matters of legal construction. Accordingly, it was unnecessary for the trial court to judicially notice facts in order to determine the meaning of the phrase "designated areas." We are unpersuaded by Coard's argument, which the trial court adopted, that designation must be shown by painted lines on the pavement. There is simply no basis for that requirement in the Code. In reaching its conclusion, the trial court ignored the plain language of Section 12-901 that imposed prohibitions "when signs are erected." For his part, Colins attached a dissenting opinion to Simpsons' take. "I do not wish to declare that Appellant must make painted roadway markings to designate a bus zone," he wrote. "I state rather that where Appellant undertakes roadway markings of a painted area for a bus zone, it is reasonable for a citizen to believe that that is the prohibited area for parking, i.e., the specific must control the general." Coard said Wednesday that he hasn't had a chance to review the opinion yet, but had some strong thoughts about it anyway. "I'll read the misguided judicial opinion and then file an immediate appeal with the state Supreme Court so it can do the right thing," he told PhillyVoice. "As John Paul Jones supposedly said, 'I have not yet begun to fight.' And that'll be a subdued and civil fight in court and an outraged and belligerent fight in front of the f****** PPA office! "I said it before and I'll say it again: F*** the robber barons at the Parking Authority that bully and steal from residents and out-of-towners who drive in Philly. I won't stop battling those bureaucratic thugs until the state Supreme Court, or the U.S. Supreme Court, interprets the city's Traffic Code correctly, which will allow me to bankrupt the a******s known as the Parking Authority." PPA Executive Director Scott Petri saw things differently. "In Philadelphia, bus zones are created through the use of street signs," he said. "When a vehicle is parked inside of a bus zone, it causes buses to block traffic and prevents passengers from safely accessing public transportation. "The court's decision in this case upheld this common sense requirement and will help protect public safety."